This was tough to watch. First of all, I am listing this documentary in the Movie Review section because this 4 hour HBO documentary debuted at Sundance Film Festival this year and was aired on HBO March 3rd and 4th. This documentary told the stories of two men who, as boys, were allegedly sexually abused by Michael Jackson for years. Wade Robinson was a 7-year old boy from Australia who met Jackson through a dance contest. James Safechurch was also a young dancer that Jackson helped in his career. Both men relived graphic sexual encounters that they claim to have had with Jackson and how these encounters shaped their lives from the first moments on. I have to say that I would have always considered myself a Michael Jackson fan. I loved much of his music and was impressed with his amazing dance talent. I remember never believing the accounts in 1993 when Jackson was originally sued for sexual abuse by a young fan (which was settled out of court). Nor did I believe that Michael Jackson was guilty when he was placed on trial in 2005, when he was acquitted. I was always seeing this through the eyes of Michael Jackson, unable to accept that he would ever do such a thing. After watching the documentary, I believe every word that Wade and James said. This was a painful and emotional roller coaster from the first moments and laid out a picture of a sexual predator who knew just how to take advantage of his celebrity to manipulate and control these children and their families, allowing him to get what he wanted. The supporters of Jackson claim that these two men are liars (both of them had lied about the abuse for years to everyone, and Wade went as far as to testify for Michael in the court case) and that there was no shred of evidence. While this may be true, the stories of Wade and James are compelling and their responses are convincing. Watching the After Neverland documentary special with Oprah Winfrey that followed the documentary, seeing James literally shake and quiver sitting their tells me something had happened. Both men told their painful stories fully and held back nothing in the documentary and, like many sexual abuse encounters, the only real evidence is the testimony of the victims. In that case, their stories felt very creditable and totally believable. Director Dan Reed, when confronted with the accusation that this documentary was one-sided, responded that the doc was really the story of Wade and James and the film would not have been serviced with people on the other side who could only state that Michael Jackson was a good guy and couldn’t have done this. Truthfully, the only people who could have known what really happened was the boys and Michael and that is where the story was focused. This documentary changed what I thought about Michael Jackson and about the reputed sickness that he had been rumored to have. This was a harrowing documentary to watch and difficult to finish. Everyone, especially parents of little children, should see this film to understand the potential dangers that can come from places that are unexpected. 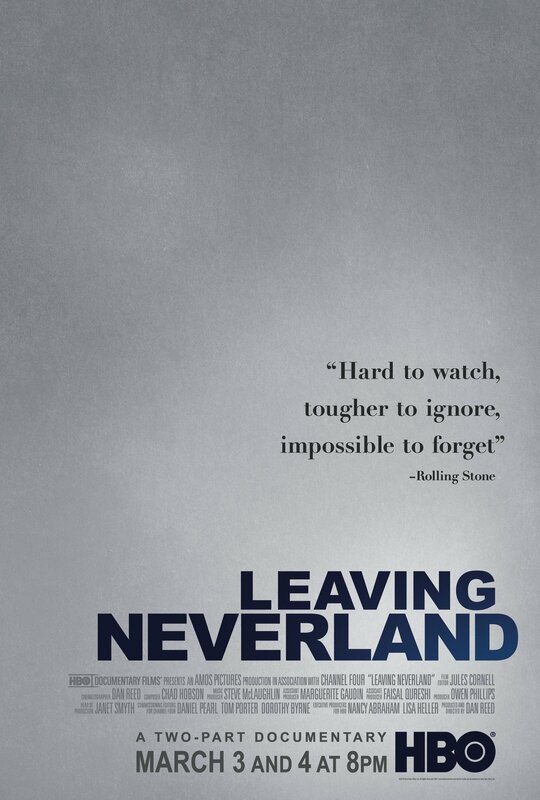 I’m not rating this documentary as that feels wrong, but I am recommending everyone watch Leaving Neverland and see what you think about the stories of these two men.